T1V announces the release of ThinkHub 4.2, which includes expanded remote participant capabilities with AirConnect Files and AirConnect Access. T1V announces its quarterly software release for ThinkHub, which introduces a robust feature set to improve remote collaboration amongst meeting participants in its AirConnect App with the addition of AirConnect Files™ and AirConnect Access™. In addition to UI enhancements and a higher-performance Stylus Mode, ThinkHub 4.2 features native videoconferencing integration for Zoom. AirConnect is the BYOD (bring your own device) companion application that allows participants to share their device screens to ThinkHub and ViewHub. With ThinkHub 4.2, AirConnect Files introduces the ability to exchange files between individual devices and the ThinkHub Canvas. Users can now share files to and download files from the interactive Canvas with their AirConnect app. This functionality includes the exchange of Canvas notes, website URLs, and media files. Similarly, users can download any media file from the Canvas to their device - making the exchange of files between team members and remote participants more seamless than ever. AirConnect Files retains the original media file size and resolution, and is currently available for all Mac and Windows devices. AirConnect Access provides remote participants the same ThinkHub controls they would experience if they were in-room. Under the AirConnect Access feature set, participants can view, control, and virtually point in the digital Canvas. Also within AirConnect Access controls, users can download the entire Canvas as a PDF. Because AirConnect Access enables remote participants to fully engage in ThinkHub’s collaboration capabilities, the AirConnect Access control panel allows the meeting organizer to control who has what level of access to the ThinkHub Canvas. Using the AirConnect credentials, remote participants will always be able to view. But the in-room organizer can specify which remote participants can control and point within a ThinkHub session. T1V is a visual collaboration software company specializing in multitouch, multiuser applications for enterprise, education, and active learning. The company’s collaboration software features BYOD (bring your own device) technology, designed to support the many devices, programs and platforms of today’s workforce. T1V’s suite of collaboration software represents total meeting room solutions that are replacing much of the hardware we equate meeting room technology with today. 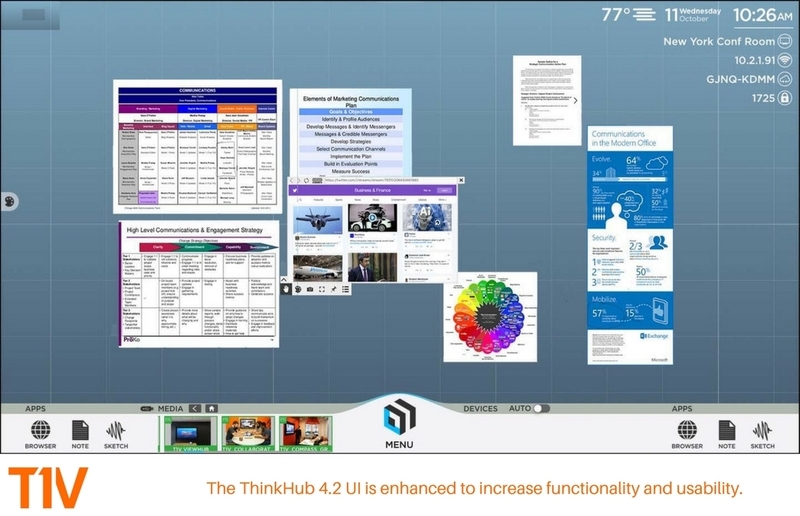 ThinkHub 4.2 User InterfaceThinkHub's updated UI has been enhanced to increase functionality and usability.